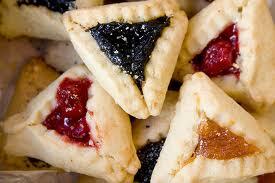 A customer asked me today if I was going to make Hamantaschen for the Jewish Holiday Purim. I’m glad she asked because I think that is a great cookie! It gives me a chance to make poppy seed and prune fillings which, in my opinion, are two of the most under-rated fillings out there. So we will have them in the cookie case starting tomorrow and up until the 24th of February.